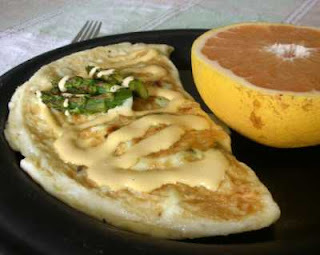 A spring treat, roasted asparagus in an omelet, topped with a French sauce called "rémoulade" [pronounced ray-muh-LAHD]. A complaint arrived this week. "Don't you cook anything except asparagus?" Well. Um. No. Not really. At least not right now, while the local asparagus is so completely gorgeous. Gorging on one vegetable during its short season is a twist that accompanies the practice of enjoying vegetables in their season, when they're at their prime and taste the best -- and often, the least expensive, too. While supermarket imports mask the seasons, eating plant foods when they're in season creates an entirely different sense of food and time passage. BUT: if Missouri seasons don't match your own or if you're just hungry for broccoli? The Alphabet of Vegetables is your home for finding great vegetable recipes. Vegetables for breakfast aren't as obvious, as predictable. More likely choices: grab a bagel, fill a bowl with cereal, peel a banana, pour a cup of coffee. But especially on weekends, when there's a bit more time to spare, and because the dish is based entirely on leftovers, it made up in mere minutes. And there is something ethereal about the combination of egg, roasted asparagus and the eggy remoulade sauce. Let butter melt on medium low in a non-stick skillet. Whisk the eggs and season. Slip gently into the skillet, swirl to distribute evenly. Let edges set, just barely. Add the asparagus and let the omelet cook, gently. When it's nearly cooked, flip one half over the other and let continue to cook. Transfer to warmed plate, drizzle with remoulade. Enjoy! Seriously, who wouldn't want to eat asparagus every day in season? Here in Rhode Island, the season is really only six weeks -- plenty of time to eat as much as you can, and freeze the rest! Thank you for the comments about eating in season. That sense of the ritual of eating makes our food so much tastier. Also, food grown locally has so many advantages -- from taste to energy-saving! Oh my you are going fancy on us here...remoulade sauce no less. At my MIL's house this weekend in NC, she brought out some fresh picked (her garden) asparagus. "I can boil it," she said. "Ack, no! Give that to me. I can cook it. You will not boil that!" We brought some home with us. Yummmmmmmy! I envy her ability to just pick her own each afternoon.